If you make changes to the Music Finder database, you will definitely want to SAVE those changes in a new MFD and store it on a USB drive or FLOPPY for backup. After all, if you change a lot of records and then simply replace that database with a new one, all of your changes would be lost. You need to SAVE that database. The steps are very similar to those for loading a database. For variety, the illustrations here are from the original Tyros. If your keyboard has the FILES option, you can skip dwon to that section. Step 1 - Press the FUNCTION button and select UTILITY [I]. 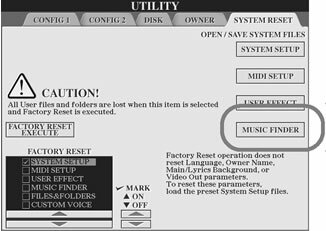 Step 2 - Use <TAB> buttons to tab over to the SYSTEM RESET page. Step 3 - Press button [I] to select MUSIC FINDER under the OPEN/SAVE SYSTEM FILES. Step 4 - Use <TAB> buttons to tab over to either the USER (or the FLOPPY, CARD, HD, USB) area. If there are already files present, you will see options to NAME, CUT, COPY, DELETE, or SAVE the file(s). If there are no files present, the only option you will see will be SAVE, button . Step 5 - Select the SAVE option by pressing . If you have loaded an MFD in this session, the name of that MFD will appear in the file name window and you can save the file under that name or rename it. However, if you have turned off your keyboard and then turned it back on since you loaded the current MFD, the name in the filename window will be set to the default MusicFinderPreset name. If you had loaded a different MFD, say the UltimateFB.MFD, and used it to REPLACE the current set of records, the PSR or Tyros does not save the filename when power is turned off. Step 6 - Put in an appropriate name of your own choosing before you complete saving "your" Music Finder database file. You can call it My Music Finder or whatever you want, but don't leave the name at MusicFinderPreset since you don't want to confuse the file you have been working on with the original MusicFinderPreset file. Step 7 - Complete the SAVE operation, by selecting button  for OK and the current set of records in memory will be saved under the name you supplied. Starting with the PSR-S900 MUSIC FINDER screen (shown here), a new FILES option was added. Selecting this option immediately opened up the MUSIC FINDER files screen. From here you could save the currently loaded Music Finder database or find a different database to append records to the current database or replace the current database. 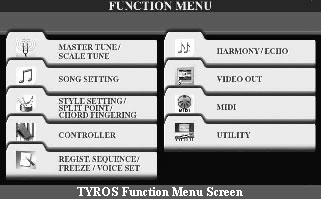 The method described above, the FUNCTION | SYSTEM RESET | MUSIC FINDER | MUSIC FINDER files screen, still works on the S900 and other newer models, but the FILES option is a quicker way to get to where you can load or save MFD files. 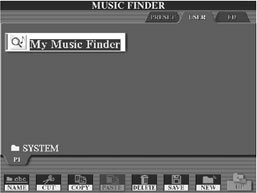 Well, now that you know all about how to load and save different MFD databases, the next lesson shows you the available options in the MUSIC FINDER system screen.